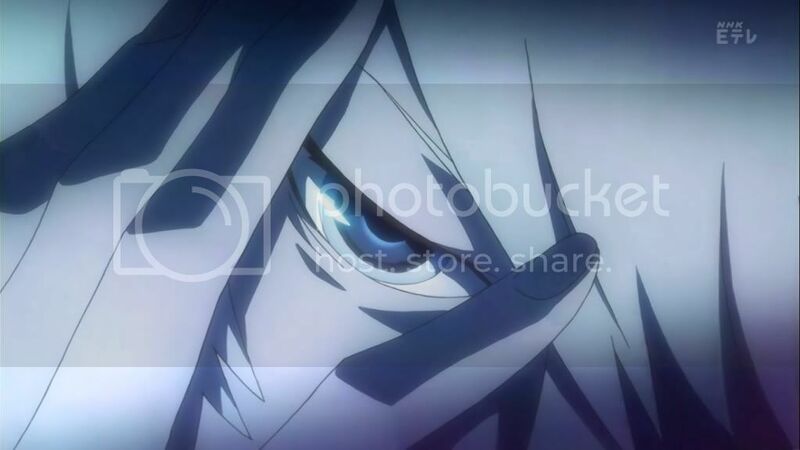 Phi Brain has a two faced allure. On the one side, it has a ludicrously exaggerated plot which is comical and begs for sarcastic mocking. On the other side, it has interesting key events which drive the plot and are strategically placed to generate enough anticipation to keep me watching. This dual sided show is definitely an interesting autumn experience. So heroic as he pulls that rope. The show starts off by finishing off the previous plots story. Our hero solves the puzzle very heroically. 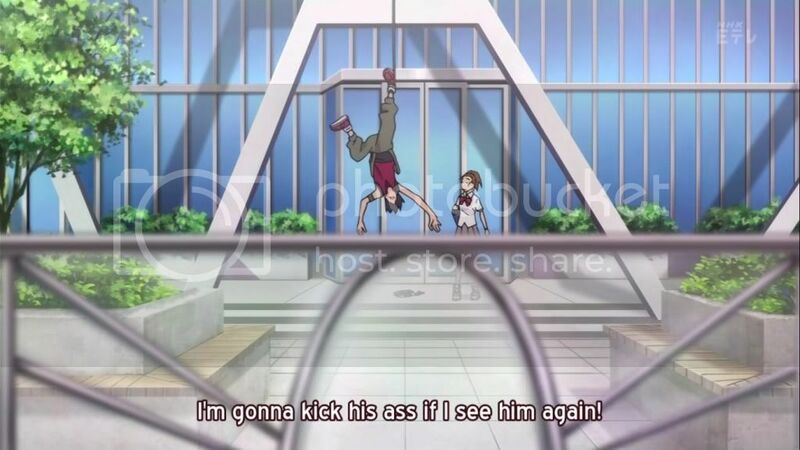 He then faints, as he must because any new superpower would brain the body, and is carried back home by Nonoha. I laughed for many minutes at this. I understand equal opportunity and am a girl myself. Despite being a refined martial artist carrying a boy bigger (and probably heavier) than you for such a long distance across varying elevations while smiling and introspecting is ridiculous. I would have forgiven her if she had been cursing and swearing about how heavy Kaito was, but she was having feminine crush thoughts. Unforgivable. I get that she's a side character that shouldn't matter, but bashing the insignificant bits is half the fun of watching Phi Brain for me. At least she knows how he ticks. He has ridiculously selective hearing. We are then introduced to the frenemy. Ah, frenemies have such amusing dynamic. I have a feeling this series will be filled with frens; it's the natural result of teaming up people in competition. The first of the batch is Sakanoue Gammon, titled Galileo. I find it interesting that they are all named from scientific figureheads of various historic ages. It's like warring the names of scientific kings. How can you really compare them to determine who the smartest is? I know, I know, I'm over thinking it. 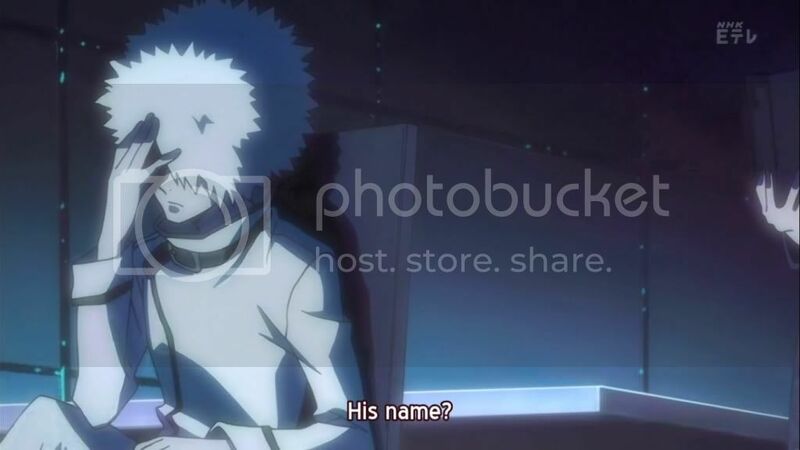 There is nothing so deep about Phi Brain's titular hierarchy. Digressing, watching Gammon and Kaito is like watching Rho and Aaro play Little Big Planet. There is a lot of heated cursing and name-calling during the game followed by silent, instantaneous making up in the aftermath. Gammon and Kaito add a layer of we'll see whose better next time before parting ways. Gammon leaves Kaito hanging... literally! Kaito is then summoned by the principal of the school and offered the title of Einstien. He explains the underlying framework of the puzzle industry he wants to indoctrinate Kaito into. It's a most hilarious sales pitch with buzz words like Sage Puzzles, POG Givers (which I assumed stands for Puzzle of God - deep, yeah? ), The Chosen Solver, The Divine Puzzle and intelligent "on the same platform as the Gods". If this wasn't enough, there is a tie in to the pyramids, ancient treasures and historic legacies. The basis of Phi Brain is the love child of The Da Vinci Code and YuGiOh. Kaito refuses to sell his soul to the devil and walks out of the principles office insulting him in morse code by playing on the word "baka" (Moron in Japanese). I bet a stellar diet can be patented here. "Eat whatever you want and become smarter! He'll definitely love you then." Our hero them proceeds to the cafeteria to recharge his batteries. At this point I begin to wonder why he is the only one who isn't in a uniform. Everyone else is wearing some variation of a uniform. I don't mind much since his Digimon-ish clothes make me nostalgic, but I am curious. I wonder if there is an explanation. While he battles it out with Gammon at the cafeteria counter - Puzzles use brain power; brain power requires energy; energy comes from food; therefore, whoever eats more thinks more - I reflect on the previous scene. While The Da Vinci Code was a page turning conspiracy theory and YuGiOh has devolved into infants play, the cliche backdrop did set the stage for the introduction of interesting people and places. Puzzles, while fundamentally challenging the brain in similar ways, take on different forms based on the originating culture. By taking about pyramids and a historic legacy, they have build a door which could lead to a diversity in the puzzles we see on the show. Considering the puzzles serve the superficial purpose of showmanship and in no way intellectually challenge the viewer, I feel that they'll keep hitting us with puzzles we haven't seen rather than recycling the same simple puzzles we see in newspapers and on iPhones. A new take on "food fight"
Kaito is then summoned for a puzzle. Gammon swoops in a steals his console telling Kaito to stop interfering with his money-making if he's not serious about taking on a title. 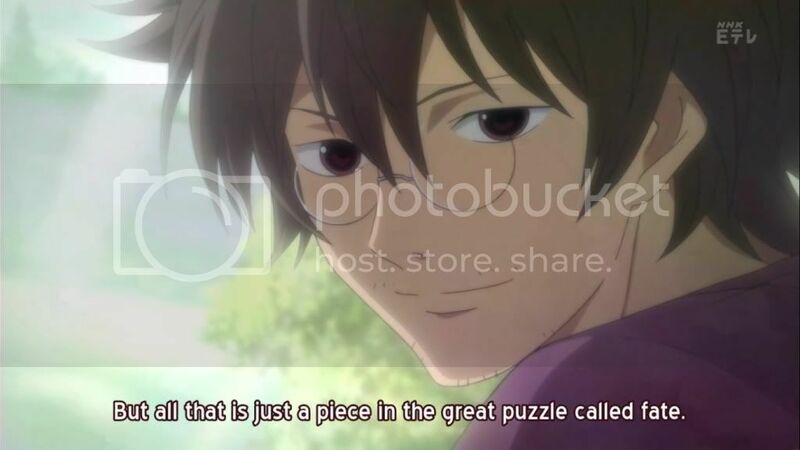 Kaito then looks at a puzzle the Gammon made for him and infers from the puzzle that Gammon must be a good guy because the puzzle he created had merit. Even though I sound like I'm mocking this logic, I'm not. People often wear exterior personalities to hide themselves from the world. This tendency is commonplace and Gammon is just an exaggerated play on this very human trait. After all, if Gammon was actually stupidly hot-headed he would not be able to create a challenging puzzle. I like this juxtaposition of emotional irrationality and hyper-rational intelligence in Gammon's personality. Then again, I have a soft spot for troubled characters. Their angst makes me want to hug them. 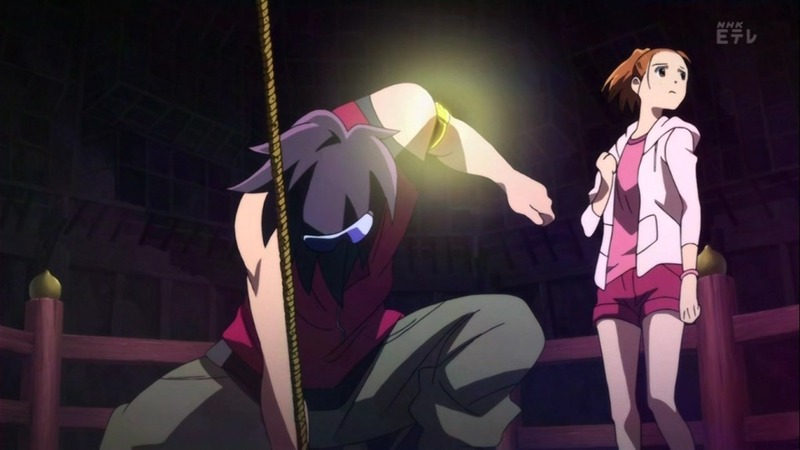 After deciding to rescure Gammon, Kaito uses Nonoha's incredible memory to get to the puzzle location. The Giver (that position name is just so pornographic) is annoyed to see Gammon in Kaito's stead, but allows all three students to take on the puzzle. 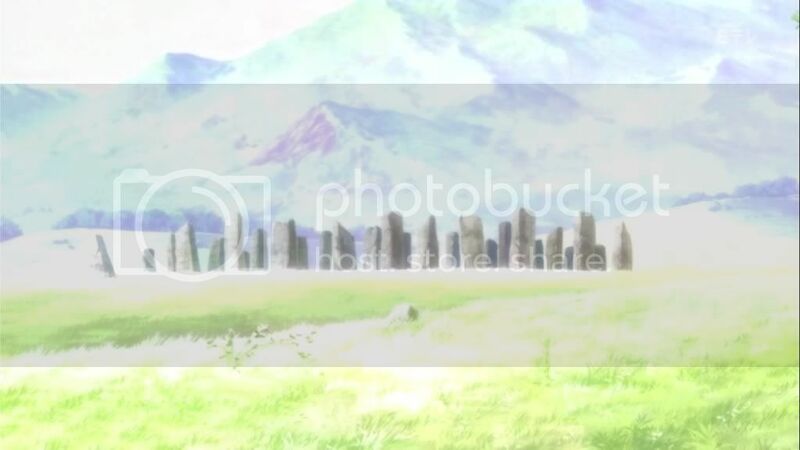 The puzzle in this episode is more familiar compared to last. It's a real like Rush Hour puzzle. I assume on an iPhone the difficulty level would clock in at about 10000, where the average app goes up to 30. They use a touchscreen apparatus (iPad in my head) to control the way the cars move. I have to say, while the puzzle itself may seem too simple for a puzzle game, I'm amazed at the complexity of engineering this Giver was willing to put into his Sage Puzzle. The complex back-end of the execution is reason enough to forgive the simple face. Of course, the Giver ruins his reputation by cheating and freezing the system so that the contestants die. The goal of the puzzle is to move the red antique car out of the playing square. The time limit is ten minutes. The consequence of failure is being crushed by a bus. 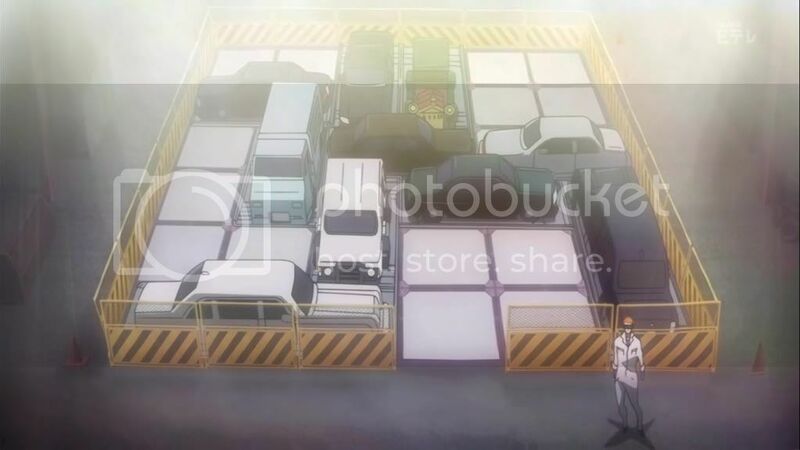 Although Gammon is quick to solve the Rush Hour puzzle, once their car is frozen right before the exit, he and Nonoha begin to rage-panic and start kicking doors and windows to no avail. They are locked in with a bus dangling over their heads waiting to fall on them in less than a minute and a half. Kaito takes control of the, uh, control and stares at it. He says things like "the puzzle wants to be solved" and "the puzzle is asking me to solve it". I giggle. 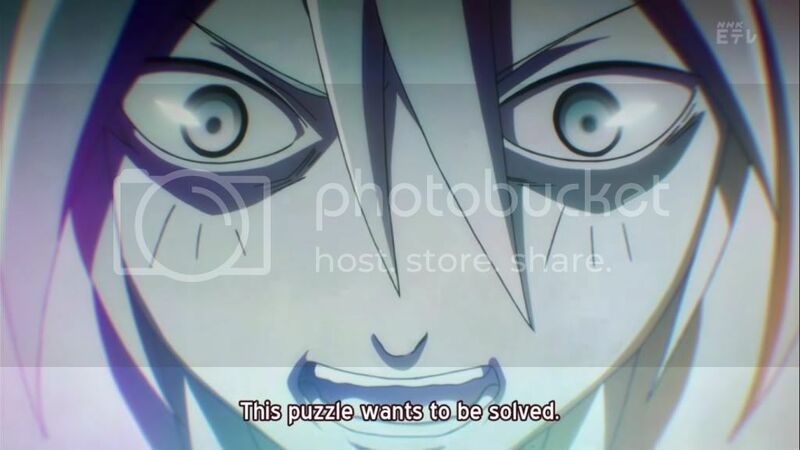 And then he manages to solve the "unsolvable puzzle". As everyday as the Rush Hour puzzle seems, the way Kaito escapes death is interesting. I certainly didn't think of his solution. In fact, if I were in his position, I'd be rage-panicing and kicking doors. Or crying. 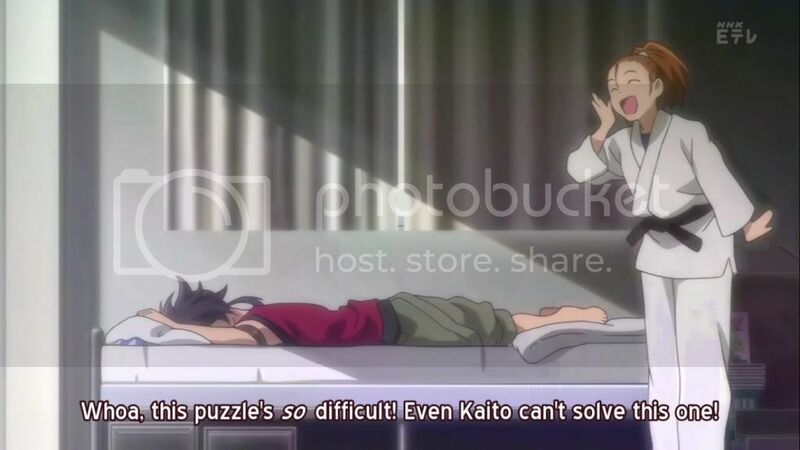 It's Kaito's out of the box solutions that keep the show entertaining regardless of the interest factor of the puzzle itself. 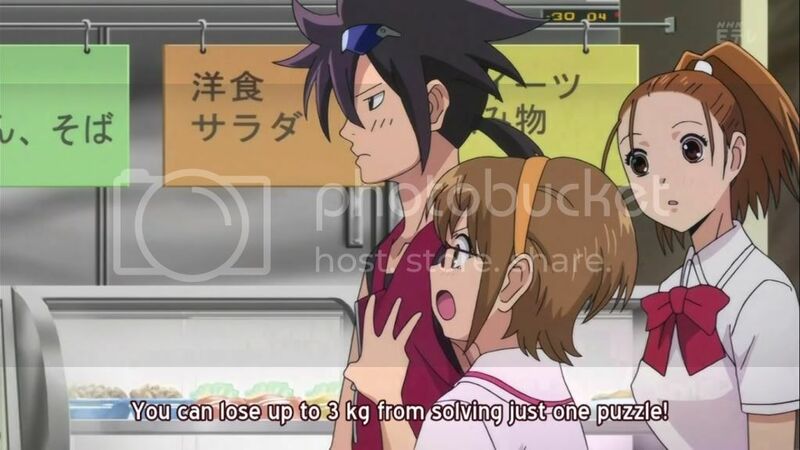 Kaito is hungry after this endeavour and decides to accept the title of Einstein because he's supposedly too broke for food. I think it's just an excuse because changing your mind and selling out are not manly enough for our hero. 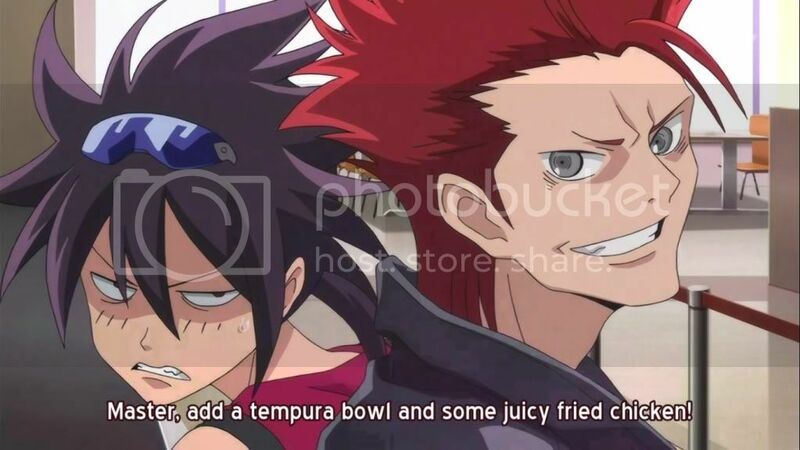 Food, on the other hand, super manly! The show ends with the principal firing the cheating Giver. I really wonder what the back story on the principal is. He's so suave and cool but he's also sleazy and business-minded. 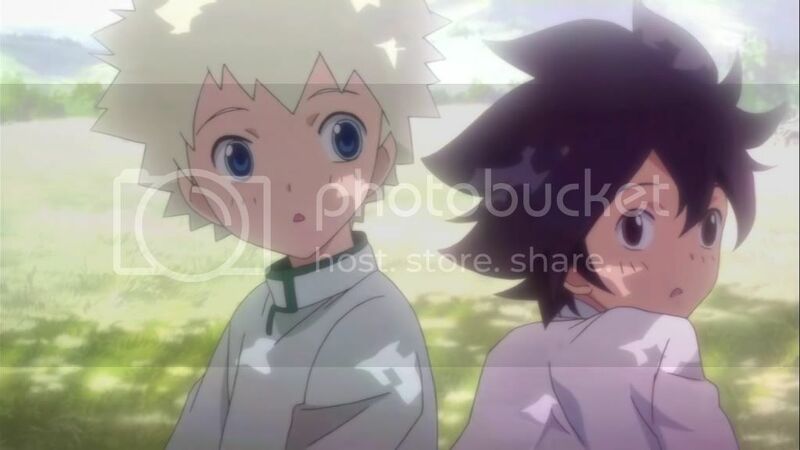 Although I mock the plot endlessly, I quite like the characters of Phi Brain. They make me want to know them more. The thickening of the plot happens with a glimpse at Kaito's childhood friend.